The 2018 BMW 3 Series is one of the top luxury small cars on the market. It currently has a higher score in safety and performance than many other cars in the market. It has comfortable and spacious seating, robust trims with fine-tuned engines, and handling that allows you to take on any road with ease. Some of the new features include a rearview camera for driver safety warnings, like blind spot monitoring, lane departure warning, pre-collision warnings, and so much more. The four-door version has great pickup, with powertrains that give you ample strength to accelerate easily. You can pick between several trims including the 320i, 320i xDrive, 330i, 328d Sedan, 330 xDrive, and Gran Turismo. The 340i is a beast with 320-horsepower, 3.0 V6 engine. 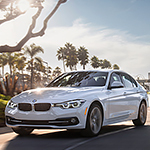 You can test drive any of the 3 Series models at BMW of Fairfax. Check out the inventory online before you go to schedule.